We’d love your help. 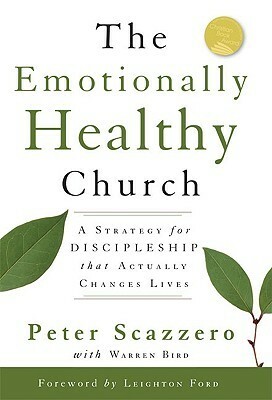 Let us know what’s wrong with this preview of The Emotionally Healthy Church by Peter Scazzero. Discipleship that really transforms a church must integrate emotional health with spiritual maturity. The Emotionally Healthy Church offers a strategy for discipleship that accomplishes healthy living and actually changes lives. To ask other readers questions about The Emotionally Healthy Church, please sign up. This was a really good read as it focused on how we as individuals have a very important part to play in helping our church to be a healthy environment. It provides numerous practical tools and gives lots of reflections on the importance of developing healthy spiritual and emotional as individuals and how when we don't have things in their proper place can adversely affect corporately our roles within our churches and the parts we try to play. I first attempted to read this book in 2015 and now (in 2016) I read it again for the purposes of a school assignment. While the content is not overly complex, I am quite puzzled as to where Scazzero plants the foundation of his thesis from. My polytechnic diploma in psychology better prepared me to read the book critically and yet I came away quite disappointed. I do understand where he is coming from, basically to embrace the brokenness in you (and your family) and not to work yourself until yo I first attempted to read this book in 2015 and now (in 2016) I read it again for the purposes of a school assignment. While the content is not overly complex, I am quite puzzled as to where Scazzero plants the foundation of his thesis from. My polytechnic diploma in psychology better prepared me to read the book critically and yet I came away quite disappointed. I do understand where he is coming from, basically to embrace the brokenness in you (and your family) and not to work yourself until you have nothing left. I do hope to see some proper citations from the experts in field of psychology to add some credibility to the "emotionally healthy" schema. The Scripture references were often proof-texts of a point he was trying to make, and after a while I had to force myself to finish the book. Basically if you are looking for a (as the subheading goes) strategy, a work-based step-by-step formula, this is the book for you. But if you are interested in meaty ecclesiology, look up Timothy Keller's Center Church or Edmund Clowney's The Church. See also Carlson and Lueken's Renovation of the Church for an account of how two co-pastors moved away from formulaic style approach to running a church. Though the start of the book is like in any American book - long, watery, tooooo long; i liked it. This is definitely the book to work through and to reread. Each chapter should be read slowly, the material helps one to dig deeper into her past, character and habits to become a truly healthier person. God is doing a restoration work in the ones who became His children. The question is whether the children are aware of this and are open to go through some hard stuff to be changed. Emotional healt Though the start of the book is like in any American book - long, watery, tooooo long; i liked it. This is definitely the book to work through and to reread. Each chapter should be read slowly, the material helps one to dig deeper into her past, character and habits to become a truly healthier person. God is doing a restoration work in the ones who became His children. The question is whether the children are aware of this and are open to go through some hard stuff to be changed. Emotional health means that a person is free from their negative past, are able to see people through grace and love, because they are aware of their own brokenness and limits and are able to incarnate Jesus here on earth while He has not come back yet. This is a solid read with good insight for church leaders as to how to develop a lifestyle that is conducive to a sustained, life-giving, non-burning out ministry. I resonate a lot with the path that Scazzero takes. From burnout to monastery to trying to live out ministry integrating contemplative practices with active mission. We're going to use this within our church and it has been a helpful guide for working through a difficult season. I remember reading this and thinking, "meh..."
I am honesty ambivalent on this book, which is lauded so highly. There are some really deep spiritual principles encapsulated in the teaching - things that are not well enough understood and should be taught more. In saying this I am a little wary that so much of the illustration comes from secular (even other religions) movies, stories, novels; and often in a critical stance against people of faith. The biblical and Christian material is often less weighty. We don't want simply a pseudo-Christi I am honesty ambivalent on this book, which is lauded so highly. There are some really deep spiritual principles encapsulated in the teaching - things that are not well enough understood and should be taught more. In saying this I am a little wary that so much of the illustration comes from secular (even other religions) movies, stories, novels; and often in a critical stance against people of faith. The biblical and Christian material is often less weighty. We don't want simply a pseudo-Christian self improvement book do we? I was gratified to read that the context of his church was amongst a relatively difficult and broken community - this strengthened his case for me. However bigger picture - I can't help but feel too much of it is Scazzero getting in touch with his feminine side (softer, relational, embracing) -there is a little quote near the end about hugging each other after women's fellowship! Really the bigger problem in the wider church is lack of properly expressed masculinity (drive, vision, courage...). A solid 3.5, but since I know a number of churches and ministries that'd highly benefit from taking its advice to heart, I'll give it a 4. I myself found healing and growth in it. However, it was hard to read after principle 2. As with all self-help books, it's superfluous and repetitive. Also, the out-of-context use of biblical passages confused me. And some portions lacked adequate exposition despite really needing it for proper application. But I suppose his other published material will fill A solid 3.5, but since I know a number of churches and ministries that'd highly benefit from taking its advice to heart, I'll give it a 4. I myself found healing and growth in it. However, it was hard to read after principle 2. As with all self-help books, it's superfluous and repetitive. Also, the out-of-context use of biblical passages confused me. And some portions lacked adequate exposition despite really needing it for proper application. But I suppose his other published material will fill in the gaps (?) I have more questions than answers, but I imagine that's the whole point. Overall, I feel it to be a vital message for the church and Christians today. I'm a huge fan of what I think he's doing and have great hopes for it. The extent of his vulnerability is impressive. A must-read for every Christian. I didn't have high expectations as I began reading this book but found myself sharing from each chapter with my wife and close friends. I highly recommend it to senior pastors, and others in church leadership. This is a good book with some good principles in it. If you are not a church leader, then read Emotionally Healthy Spirituality instead. It sometimes does have a frustrating writing style - either stating a problem without then giving the answer, or at times over stylising an answer with his soundbites when it is much simpler than that. But overall, if you can loom past these, it's a helpful book. I didn't love this one for a lot of reasons. My bigger problem is that I don't believe the sinner's prayer will save your soul, which is mentioned early on in this book. The plan of salvation includes hearing the word of God, believing the Word, repenting, confessing, being baptized (immersion) (Mark 16:16, Romans 6:3-11) and remaining faithful. This was a great read...Scazzero writes clearly and gives interesting, readable examples to all of the principles. He puts emotional health in the proper place in the church....vital to our growth as individuals and as leaders, but not as important as the gospel because Jesus is the star. Would definitely recommend to any and all church leaders/attenders. This book was quite helpful to me in realizing my lack of setting limits and of allowing myself to rest so that I can be whole to take care of others. I think that is is a very good read for anyone in church leadership. Awesome book, it is a true must-read for leaders in the Church and for anyone who wants to take new steps in their faith walk. Scazzero’s words resounded with me and I found his thoughts very insightful. Helpful accompaniment to “Emotionally Healthy Spirituality.” I think he’s dead on when it comes to this need in our discipleship. I’d love to see the church where he serves and how this is put into practice. This book attempts to cover a lot of emotional territory. It gets you thinking, it’s a decent start but by no means a comprehensive manual or guide for emotional health. My Sunday School Class has been reading/studying this book. It was a good book for discussion. I particularly liked the insight on grief and grieving. This book is a must read because it gives Christianity and spirituality a difficult, but practical use. This review has been hidden because it contains spoilers. To view it, click here. Helpful for evaluating personal growth as well as the growth/development of a church. It does not examine typical topics like finances, denominations, liturgical rituals, etc. I read both "Emotionally Healthy Spirituality" and "The Emotionally Healthy Church" within a few weeks of each other, so there was some cross over. Very helpful and insightful. Highly recommended.